Although today is April Fools Day, the joke is going to come a few days later in the form of potentially heavy rain and snow showers. The bulk of the system appears to be arriving on Sunday and continuing into Monday, and as low temperatures will be hovering around freezing it’s likely that we’ll see freezing rain turning into flakes late Sunday in south-central Minnesota. This week has been fairly stable weather-wise, though, and with highs in the 40’s the temperatures have even been pleasant accompanied with little wind. Today is another one of the cooler and grayer days, however — with winds gusting toward the 20 mph range — but tomorrow promises to be beautiful with plenty of sun and a high near 50 degrees Fahrenheit. The sustained cool temperatures have remained in the low to mid-40’s during the day and below freezing at night; these conditions have undoubtedly been the saving grace for those along the flooding Minnesota River. Instead of the feared rise more akin to last spring or fall, then, this spring’s floodwaters have only gradually gained in height, allowing for much of the snowmelt runoff to make its way further downriver overnight before more enters the waterway during the day. Because of this, the river has perhaps already crested, allowing for the reopening of the Hwy. 99 bridge heading east out of St. Peter (although there is still a closure of one of the northbound lanes of Hwy. 169 north of town). Unfortunately, we’re not out of the woods yet; much depends on the intensity of the coming storm system on Sunday and Monday that could drop another significant amount of moisture into the Minnesota River watershed, resulting in a second crest. 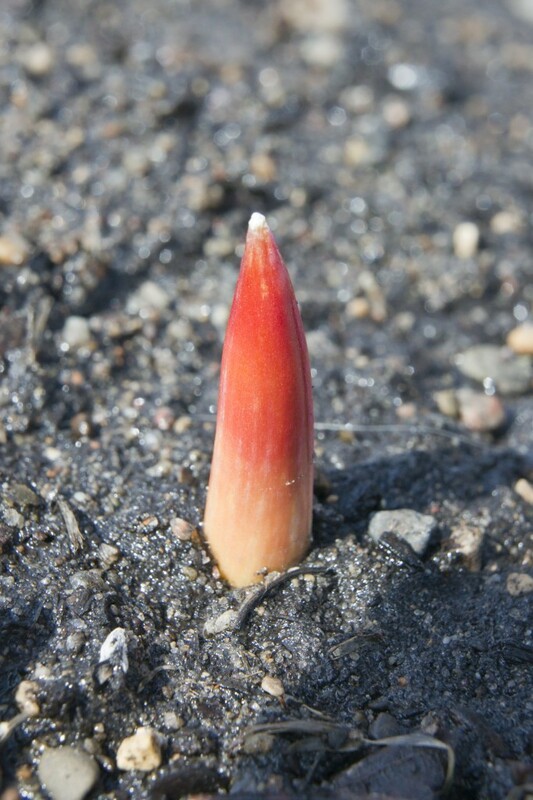 Tulip sprouting in Evelyn Young Gardens behind Interpretive Center, 3/29/11.